All transactions are safe and secure with a reliable history in online purchasing behind each of our associates. 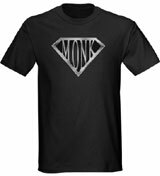 Buy the Super Monk t-shirt to own Monk clothing and merchandise. It's a bird, it's a plane, it's Super Monk! Okay, so he may not be faster than a speeding bullet, but when it came time for the statewide police physical fitness test, Monk (Tony Shalhoub) pulled his own weight. Perhaps the likeness is limited to fighting crime and delivering the criminal but to me that's a hero...a superhero. Mr. Monk even has a lady by his side, assistant Natalie Teeger (Traylor Howard), who is well aware of his true identity. In addition to the Super Monk tee above, browse the Monk Clothing Gallery for more apparel like men's and women's clothes, kids shirts or hoodies.